The success of Peterloo Poets comes from Harry Chambers’ unerring dedication to and love of poetry. With Peterloo Poets Harry set out ‘to advance the education of the public in poetry of merit with particular reference to the work of new and neglected poets’. 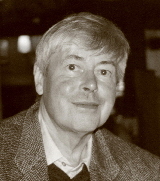 During his University career (Liverpool 1956-58) Harry Chambers founded the literary (later exclusively poetry) journal Phoenix (1959), which ran until 1975, gaining a national and international reputation. Harry was also Editor and first Literary Editor of the students fortnightly newspaper, Guild Gazette (1961-62). Harry’s career began in teaching and lecturing where he was responsible for sixth form A level English Literature teaching. He was Assistant Master at the Percy Jackson Middle school, Woodlands, Doncaster with special responsibility for drama where he produced plays and edited issues of the school magazine, Balkite. In 1964-67 Harry was Lecturer in English at Stranmillis College of Education in Belfast and in 1967-77 was senior lecturer in English at Didsbury College of Education / Manchester Polytechnic where he founded courses in Children’s Literature, Twentieth Century Poetry, Newspaper and Journalism Studies, Satire, Detective Fiction, and Creative Writing, making full use of the Arvon Foundation at Lumb Bank in organising the creative writing course. Harry was also Editor of the Staff-Student newspaper, Didsbury Voice and of the Staff Journal. He organised the creative writing element of the Didsbury Project for Gifted Children (1973), was a committee member and poetry organiser for MICA (Manchester Institute of Contemporary Arts) (1967-70), was organiser of poetry events at NATE (National Association for the teaching of English) annual conference, Manchester University (1969) and was co-editor of Young People’s Poetry Anthology (North West Arts, 1970). Harry has been an examiner in English Literature at all levels and an Open University tutor in Twentieth Century Poetry (1977) and an Open University tutor in Drama (1981). Harry took early retirement (at age 40) under the “Crombie” scheme and moved to Cornwall in 1976 where he founded his own poetry imprint Peterloo Poets with funding from the Arts Council of £2,000. Peterloo Poets funding later devolved to South West Arts and then latterly to Arts Council England . Harry ran the press single handed until 1980 when his wife, Lynn Chambers, became full time administrator. As publishing director of Peterloo Poets, Harry Chambers had involvement involvement in all aspects of publishing operations. Harry took exclusive control of selecting volumes for publication under the Peterloo imprint from the hundreds of unsolicited manuscripts submitted each year (over 1,000 per year). Manuscripts were also solicited / commissioned for consideration. Harry was involved in all aspects of typography, layout and design, including choice of cover illustration / design in close consultation with the respective poets. Peterloo cover designs have always been recognised as ‘top of the class’ among the small poetry presses. Over its 37 years of publishing 131 different poets were published by Peterloo Poets imprint and more than 240 different volumes of Poetry published. Harry Chambers continued editing poetry journals and anthologies: Poetry Matters, An Enormous Yes, Causley at 70. Harry Chambers is an honorary member of the Charles Causeley Poetry Society. As well as its annual poetry publishing program Harry ran the Peterloo Poets Annual International Poetry Competition, annual Poetry for Schools events and workshops and organised and ran the Peterloo Poets International Poetry Festival from the Old Chapel in Calstock; Peterloo’s base for the last 12 years. Since his retirement as Publishing Director of Peterloo Poets, from his new home in York, Harry Chambers continues to organise and introduce poetry events, give talks and poetry readings and conduct seminars on poetry and publishing. Harry writes articles on poetry and publishing and gives interviews to press, radio and television. On the subject of his lifetimes dedication and love for poetry Harry Chambers often recalls a quotation from one of his favourite novels “Everything must, in one way or another, go. One does what one is wound to do” The Mouse and His Child, Russell Hoban. In 2010 Harry’s tireless devotion to literature is to be recognised with an MBE for Services to Poetry.